The Emotional Art Therapy Activity You Can Do Everyday! I do this activity several times a week to check in with my own emotions and allow them to express themselves in a healthy, creative way. I find I truly get into this and it takes a lot of energy! - Anything else such as glitter, faux jewels, pom pom balls, etc. Recommended: Wear old clothes for this art therapy activity as it can get really messy! 1. You will need an easel because you will use your entire body for the art therapy emotional painting activity. 2. Draw some squiggly lines on your canvas with a dark marker to begin your art therapy activity. 3. Next, begin rolling paint, brushing paint, squiggling, and spraying with water as needed for this art therapy activity. Add other materials as needed. The more water you spray the better! 4. This is a very physical art therapy activity. Go with your emotions…. Paint as much and as long as you need to. Allow your body to go with the flow and move where it wants to. Try touching the paint and using your fingers, or take a rag and blot the canvas after painting on it. The goal is to create movement, texture, space, and color that represents your emotions at that moment. 5. Don’t worry about finishing the art therapy activity. Feel free to come back to it when you want to release your emotions. 6. Try to do this art therapy activity as often as possible as an outlet for your emotions (positive and negative). 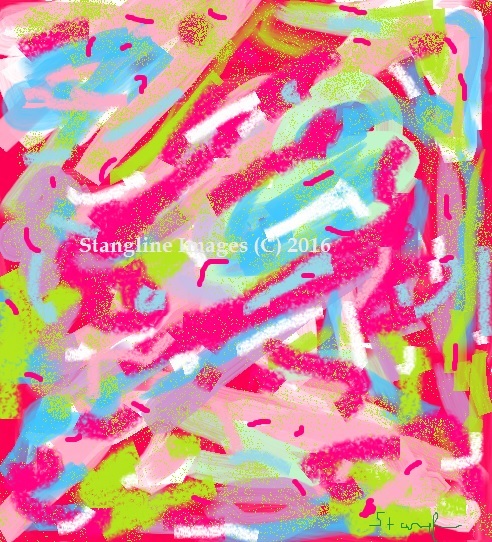 Create a collection of art therapy emotional art for your art gallery!